My first darling to go is a simple extension of something that already exists; the lava radiator. Photo by Wollschaf (CC BY-SA). Remember the Lava Lamp? Of course you do; versions of it are available next to everywhere. But they are all built following the original design principle; a bottle of some kind (variants include rockets and liquor bottles), and an incandescent lamp under it, acting as illumination and heater for the wax. Photo by Bios (CC BY-SA). That's all fine and dandy, but would a lava lamp be able to scale up to a radiator? Electrical heaters, as well as water based ones, work by being warm and emitting that heat into the space they're mounted in. But they look pretty boring. Think of a rectangular box, perhaps 10 centimeters deep, one and a half meter wide and about a meter high, for a modestly sized radiator. Then fill it with almost 150 liters of lava lamp innards. Mount LEDs and heating resistors along the bottom. There it is, in its monumental simplicity. A grotesquely large lava lamp that, is my thought, could do its magic in completely new ways, due to its unusual appearance and construction. Sketch of the Lava Radiator. Imagine this in color, raytraced using POV-Ray and mounted along a smooth, white wall, underneath a window. That's what I imagined. Instead, you get a crackpotogram, drawn in Gimp while riding the bus. The lava radiator could be a nice touch to a public space. A 1000-or-more liter version could easily be an attraction in an art exhibition. 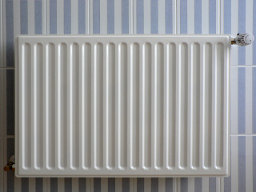 Using heating resistors and LEDs instead of incandescent lamps could improve the radiator's aestethic value, as it could be used with or without lighting, and given individual control of the resistors, the internal flow of the fluids could probably be controlled in ways not possible with the original lava lamp. 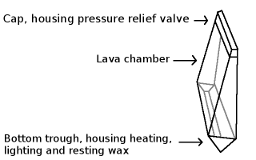 If electricity is not the first choice when planning heating (and it shouldn't be, really), it could be possible to build the radiator using water heating, mounting small radiators in the bottom of the lava radiator. With a few small radiators, it should be possible to control the flow pattern in much the same way heating resistors should be able to. The wedge shape of the radiator depicted above is a direct inheritance from the lamp it's based on. My understanding is that it reduces the fluid volume versus cooling surface ratio, giving a more articulated temperature gradient than possible with a straight tube. The same effect could be accomplished by a container of even thickness that is being increasingly creased towards the top, or simply a higher container. I think this is a great idea. You should do it! Mathmos does in general not sell lava lamp contents separately, but they do have one product called Mathmos Monster Lava Lamp, which can be refilled. Refills start at a price of £362 (about 450 Euros at the time of writing) for an unspecified amount. My questions about prices for specific amounts has not been answered, but given that their Monster Lava Lamp is 200 by 20 centimeters, I guess that price is for about 62 liters of goo. Linear (and possibly unflattering) extrapolation give a price of about 1075 Euros for 150 liters, and 7165 Euros for 1000 liters. UPDATE: I finally got a reply, saying that no, Mathmos does not sell lava separately. Well, then. It's a pity you don't have a donate button! I'd without a doubt donate to this superb blog! I suppose for now i'll settle for book-marking and adding your RSS feed to my Google account. I look forward to brand new updates and will share this blog with my Facebook group. Talk soon! The spam bots are getting better and better at sucking up to blog authors while being at least somewhat credible.